Andhra Pradesh Chief Minister N Chandrabab Naidu, key interlocutor among 21 opposition parties demanding verification of at least 50 per cent of polled votes against VVAPT slips, alleged the Election Commission was functioning under the 'guidance' of Prime Minister Narendra Modi and the BJP. Naidu had met Chief Election Commissioner Sunil Arora Saturday to raise the issue of alleged malfunctioning of EVMs. 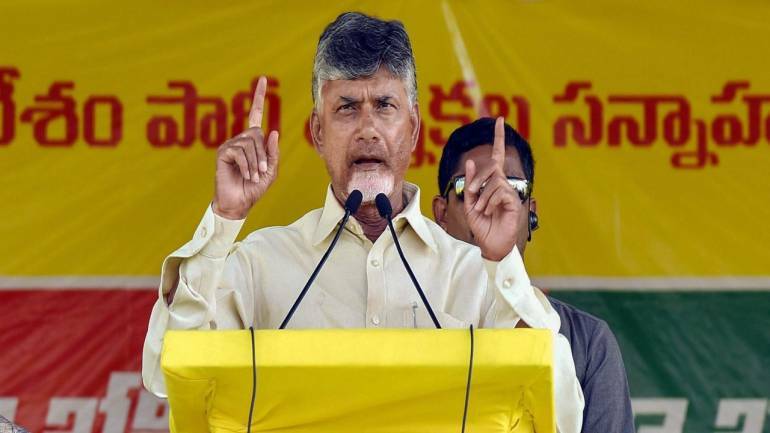 The Telugu Desam Party (TDP) chief also asked the people of Karnataka to vote in favor of the JD(S)- Congress coalition candidates in the coming Lok Sabha polls. Alleging that the independent functioning of all constitutional organisations is under threat,he said "We are all together to fight against EVMs...as of today EVMs are vulnerable." Demanding verification of VVPAT paper trails of 50 per cent of the EVMs, he said "...we all suspect that the government of India and also the Election Commission of doing some fraud in VVPAT." Naidu on Monday campaigned in Mandya,where Chief Minister H D Kumaraswamys son Nikhil is the joint candidate of the ruling JD(S)-Congress alliance. Noting that this was a very important election for the nation and not just for Mandya or Karnataka alone, he said, "I'm appealing to all of you in Karnataka ...you have to vote for the JD(S)-Congress candidates. Naidu alleged that the current Prime Minister was the least accountable one in the last 70 years.